An important feature of every room are its acoustical properties. These properties not only influence the speech intelligibility but can also determine how we perceive a musical performance. For many rooms the acoustic qualities are an afterthought and corrective measures have to be implemented, often at great cost or with suboptimal results. Our Sabin prediction software tool can serve as a fast and easy to use aid in finding the appropriate treatment for a room. A more time-consuming and expensive option is the use of raytracing based simulation software. Better yet of course is to consider the acoustical requirements during the initial design of the room. 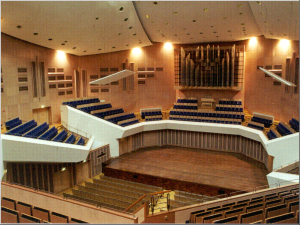 In projects where the acoustics is a defining feature, such as concert halls, the use of scale models to verify designs is indispensable. Whether it is in a room that has problematic acoustics, or in rooms designed to have great acoustics for a specific purpose, measuring the acoustic properties of the room is essential for an objective assesment. The reverberation time is probably the best known room acoustical parameter used to quantify the acoustics, but there are many more that are regularly used by acousticians and researchers. The most important of these are formalized in the ISO 3382 series of standards. All parameters described in ISO 3382 (and many more) can be measured using our Dirac software. The measurement of acoustical parameters is usually based on impulse responses. To perform these measurements in compliance with ISO 3382 you need an omnidirectional sound source such as the OmniPower type 4292-L, and a power amplifier such as the Type 2734 to emit the MLS or sweep test signals. The room response is then picked up using a microphone or a handheld meter with an analogue output such as the B&K Type 2250 Analyzer. The signal is captured by Dirac through a standard sound device such as the Triton, and deconvolved to arrive at the impulse response. For spaciousness parameters such as the lateral energy fractions (LF and LFC), Dirac supports dual channel measurements using a microphone probe or a combination of omni- and bi-directional microphones. 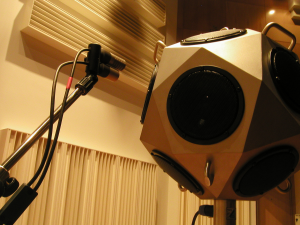 To measure the interaural crosscorrelation (IACC) an artificial head needs to be used. For measurements of the Strength (G) and related parameters such as the early and late strength (G80 and LG), and the early and late lateral sound levels (GEL and LG), the sound source needs to be calibrated. This calibration can be performed either in a reverberation chamber or in a free field environment. 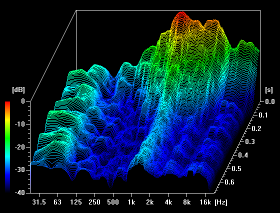 Traditional impulse response measurements based on the deconvolution of MLS or sweep signals, require the sound source and the microphone to be connected to the same sound device. This is because the slightest difference in clock rate between playback and recording could result in a very noisy impulse response, or even no recognizable response at all.1) The MLS in particular is very sensitive to timing variations. Dirac is able to compensate for any clock rate difference between playback and recording. This makes it possible to play an MLS stimulus from a CD or MP3 player (asynchronous to the recording) and still get almost the same results as with synchronous (or closed loop) measurements. This unique feature of Dirac is also used with the Echo Sound Source, which doesn't require any connection to the PC that records the response. In large rooms many measurements are needed to capture the acoustic properties. In concert halls and similar venues many hundreds of measurements may be required. The measurement tools that are used should support these scenarios effectively. This not only means automated measurements, but also, perhaps even more importantly, the efficient and flexible handling of a large number of impulse responses. Dirac was written to the requirements of experienced acousticians who use it daily for small and large measurement projects. Dirac supports automated measurements based on a fixed interval, a trigger signal or a combination of both. New measurements are automatically added to a project, and graphed for immediate feedback on the measurement quality. Repeated measurements at a single measurement position can be pre- or post-averaged to improve the Impulse to Noise Ratio (INR). Measurements can be grouped and compared with reference curves. Averages, minimum and maximum values as well as standard deviations can be graphed and tabulated. The biggest timesaver is the possibility to save any selection of parameters for all files contained in a project. The exported data can be used in a spreadsheet or other software for further processing or reporting. Advanced users of Dirac can automate almost any task using the built-in Python scripting engine. The analysis of a measurement starts with the visual inspection of the impulse response. Different views of the impulse response, such as the Energy-Time curve, the Decay curve and the frequency spectrum, provide a lot of information at a single glance. Disturbing reflection and room modes can be seen instantly. Sometimes it is necessary to make small modifications to the impulse response, for instance to remove disturbances or to shift the impulse response in time, to make it easier to analyse. With the extensive waveform editing facilities in Dirac, you can not only modify measured impulse responses, but also create synthetic impulse responses to aid in research projects. Listening to an impulse response can be just as important as seeing it. Dirac automaticaly normalizes the selection you make for listening, so you can easily inspect the quietest parts of the impulse response. A problem heard in the impulse response can often be localized by listening to the band filtered response. Particularly for scale model research it is important to be able to auralize an anechoic recording using the impulse response. There is no single parameter that adequately captures all elements of the acoustics of a room. Each parameter represents a different view of the room. A piece of the puzzle that needs to be solved by the acoustician. It is therefore helpful to able to extract many parameters from a measurement. In Dirac you can choose among some 80 different parameters, many of which can be further configured. Most often, analysis requires more than a graph of parameter values versus frequency for a single impulse response. It should be possible to average multiple measurements, see deviations from the average, and to compare the results with a reference curve. In some cases a graph of parameter values versus the source-receiver distance is important.